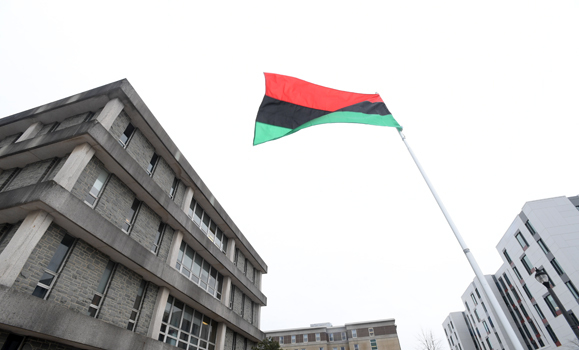 When Dalhousie first raised the pan-African flag on campus in February 2017, it added a symbolic new tradition to its African Heritage Month celebrations. On Monday, the university once again raised the flag to kick-off the month of activities and action — only this time it was one of several institutions and communities across Nova Scotia doing so. 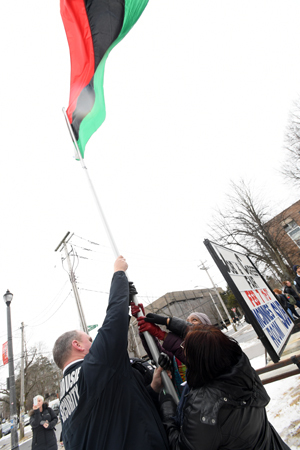 The City of Halifax held its first pan-African flag raising Februay 1, while St. Francis Xavier University in Antigonish did so a day earlier. Each made history with the gesture, signaling solidarity with all peoples of African heritage. 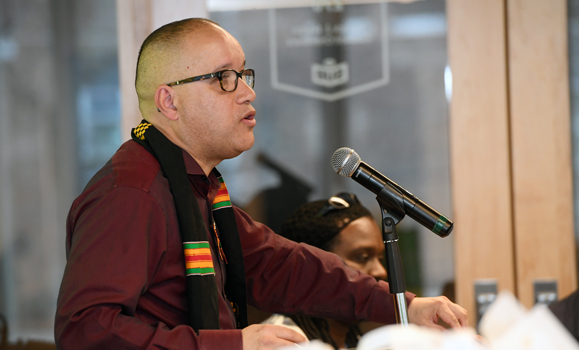 “It’s an acknowledgement of the critical role of people of African descent, not only in Nova Scotia, but across Canada,” said Isaac Saney, director of Dal’s Transition Year Program (TYP) and a professor in the Department of History, who served as MC of the event. Teri Balser, Dal’s provost and vice-president academic, delivered remarks on behalf of the university’s interim president, Peter MacKinnon, who was out of the province for a work engagement. 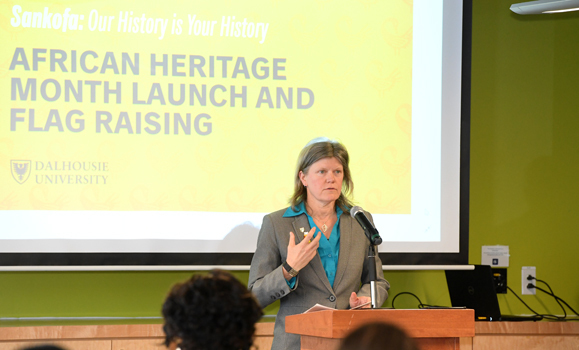 Though new to Nova Scotia and Dalhousie, Dr. Balser said she’s already noticed how “deeply resonant” the theme of this year’s provincial heritage month — ‘Our history is your history’ — is at Dalhousie. “Our 200-year history offers some inspiring examples of how Black leadership and vision have informed, challenged and inspired the community to lead positive change,” said Dr. Balser. She pointed to past Dal beacons such as Burnley ‘Rocky’ Jones, an alum and founder of the TYP program, and the leadership of Kevin Hewitt and Barbara Hamilton-Hinch, the two Dal professors who joined forces with community advocate Wayn Hamilton in 2001 to launch the STEM outreach group Imhotep’s Legacy Academy. She spoke about the university’s efforts to look into its own past connections to the more difficult parts of African Nova Scotian history, including the trans-Atlantic trade in enslaved peoples, with the Lord Dalhousie panel, the recognition and proclamation last fall of the International Decade of Peoples of African Descent, and its work in carving out a broader institutional strategy for African Nova Scotians to moving forward. “We recognize that we need to learn from the past in order to create a truly equitable institution today and for future generations,” she said. 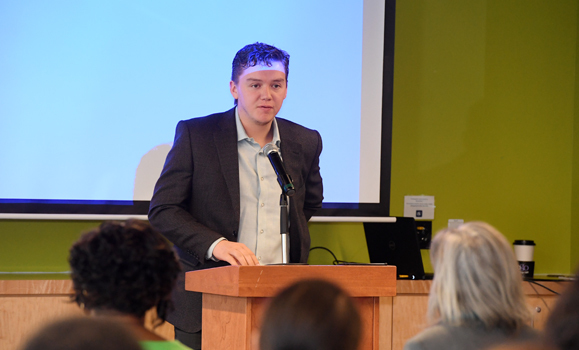 More than 100 people came out to the for the kick-off event, held in the council chambers in the Student Union Building. The flag raising took place on the lawn outside the SUB at the corner of LeMarchant Street and University Avenue. 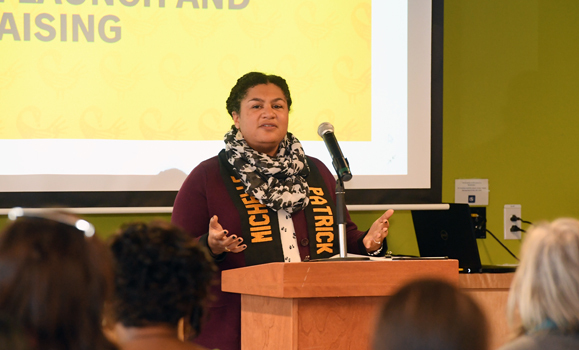 For Michelle Patrick, acting associate director of recruitment in the Registrar’s Office at Dal and co-chair of the Black Faculty and Staff Caucus, the month-long series of activities and events represents an opportunity to ask difficult questions. Michelle Patrick, co-chair of the Black Faculty and Staff Caucus. She praised Dal’s proclamation of the Decade of Peoples of African Descent and celebrated the Year of Belonging lecture series that brought speakers such as U.S. civil rights activist Angela Davis to campus during the university’s 200th year to reflect on the question: what would it take to create a world where we all feel like we truly belong? Aaron Prosper, president of the Dalhousie Student Union (DSU), began his remarks by recognizing his predecessor Amina Abawajy (now an education advisor with Dal’s Human Rights and Equity Services) for being a trailblazer as the first person of African descent to hold the role. Prosper, who is from Eskasoni First Nation in Cape Breton, made history himself last year when elected the first Indigenous DSU president. Prosper drew on Mi’kmaq teachings to emphasize the shared history of African Nova Scotians and Indigenous peoples across the province, sharing an anecdote from childhood about the time his grandfather spoke to him about the closeness of the two communities. 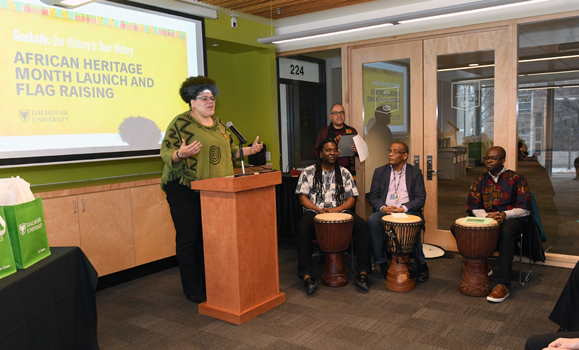 Vanessa Fells, program coordinator for the Nova Scotia Decade for People of African Descent coalition, touched on that shared history as well — noting her own Mi’kmaq and African Nova Scotian roots. Her great grandmother was Mi’kmaq and lived on reserve. “We spend a lot of time focusing on the negative and not focusing on everything that we’ve actually achieved in these 400-plus years that we’ve been here,” she said, noting the difficult struggles African Nova Scotians have survived. Attendees also heard from a number of other speakers as well, including Reverend Rhonda Britton of New Horizons Church and moderator of the African United Baptist Association and Aisha Abawajy, co-founder of the student-led Dalhousie Black, Indigenous and People of Colour Caucus (BIPOCUS). 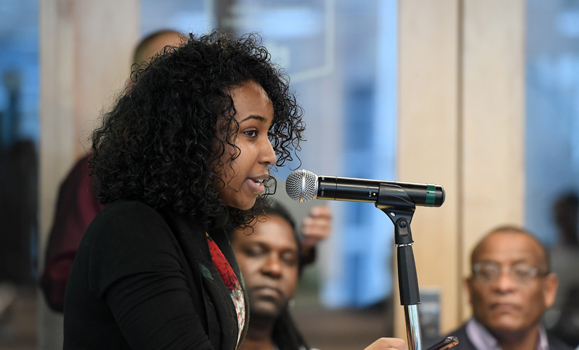 A fourth-year applied computer science student, Aisha spoke about her motivations for supporting BIPOC students, mentioning her younger brother’s experience of anti-Black racism at school. Many people’s remarks drew on the Sankofa principle, often illustrated with a bird moving forward while looking back, symbolizing how the past can inform the future. To find out more about this year’s African Heritage Month activities, visit the Human Rights and Equity Services website. The pan-African flag flies on Studley Campus.